Sandmeyer Steel Company stocks dual-certifiable Nickel 200/201 commercially pure nickel plate in the annealed condition in thicknesses from 3/16” (4.8mm) through 1” (25.4mm). Nickel 200/201 plate combines good mechanical properties with excellent resistance to many corrosive environments. Nickel 201, the lower carbon chemistry, is preferred for service in temperatures above 600°F (315°.C). Nickel 200 and 201 plate offer outstanding corrosion resistance to caustic soda and other alkalis. They perform best in reducing environments but can also be used under oxidizing conditions when a passive oxide film is formed. They are used in aerospace, chemical and petrochemical processing, food processing, and marine and water treatment applications. Nickel 200 and 201 are both highly ductile across a wide temperature range and can be easily welded and processed by standard shop fabrication practices. Nickel 200 (UNS N02200) and 201 (UNS N02201) are dual-certifiable wrought nickel materials. They differ only in the maximum carbon levels present—0.15% for Nickel 200 and 0.02% for Nickel 201. Nickel 200 plate is normally limited to service at temperatures below 600ºF (315ºC), since at higher temperatures it can suffer from graphitization which can severely compromise properties. At higher temperatures Nickel 201 plate should be utilized. Both grades are approved under ASME Boiler and Pressure Vessel Code Section VIII, Division 1. Nickel 200 plate is approved for service up to 600ºF (315ºC), while Nickel 201 plate is approved up to 1250ºF (677ºC). Both grades offer outstanding corrosion resistance to caustic soda and other alkalis. The alloys perform best in reducing environments but can also be used under oxidizing conditions that produce a passive oxide film. They both resist corrosion by distilled, natural water and flowing seawater but are attacked by stagnant seawater. Nickel 200 and 201 are ferromagnetic and exhibit highly ductile mechanical properties across a wide temperature range. Both grades are easily welded and processed by standard shop fabrication practices. Nickel 200 and 201 plate possess excellent resistance in many corrosive environments including hydrofluoric acid and alkalis. These alloys perform extremely well under reducing conditions but can also be used in oxidizing conditions due to the formation of a passive oxide film. The outstanding resistance of Nickel 200 and 201 plate in caustics is based on this type of protection. In conditions where temperatures exceed 600ºF (315ºC), Nickel 201 plate is the preferred material, due to its lower carbon content. The resistance of Nickel 200 and 201 plate in mineral acid applications varies depending on the concentration and temperature, as well as if the solution is aerated. The alloys perform better in non-aerated acid solutions. Nickel 200 and 201 plate perform well in acids, alkalis, and neutral salt solutions. However, in oxidizing salt solutions, strong corrosion can take place. Both alloys resist dry gases at room temperatures. Nickel 201 plate can be used in hydrogen chloride and dry chlorine gas up to 1022ºF (550ºC). Nickel 200 and 201 plate can be easily welded and processed by standard shop fabrication practices. Hot bending operations should be performed in the temperature range of 1600º to 2250ºF (870º to 1230ºC). In any operation, care should be taken to avoid heating Nickel 200 and 201 plate above the upper temperature limit of 2250ºF (1230ºC). Nickel 200 and 201 can be worked by any conventional cold-forming method. The forming characteristics are comparable to those of mild steel; however, because of the higher elastic limits of Nickel 200 and 201, greater power will be needed to perform the operations. Severe forming can be done manually but will require intermediate anneals to restore the alloy’s softness. Nickel 200 and 201 plate should be machined in the annealed condition whenever possible. 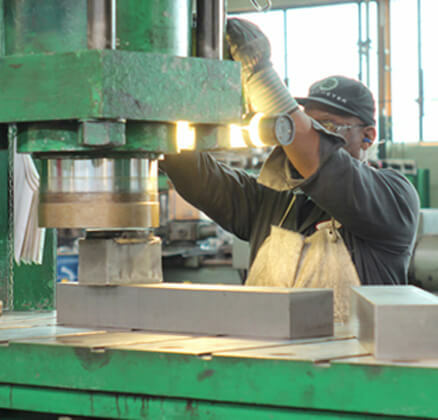 These grades have the propensity to work harden, making it necessary to utilize low cutting speeds and requiring the cutting tool to stay engaged at all times. An adequate chip depth is important in order to avoid contact with the previously formed work-hardened zone. Liquid cold forming lubricants should be utilized to assure optimal heat dissipation. Nickel 200 and 201 plate can be joined by a variety of welding procedures including inert gas and resistance welding. Welding practices are similar to those used to join austenitic stainless steels. Neither preheating nor post-weld heat treatments are usually required. Nickel 200 and 201 plate can also be joined to steel with Nickel Welding Electrode 141 and Nickel Filler Metal 61. In general, Nickel 201 plate can be welded by the same procedures as Nickel 200 plate with one exception. The oxyacetylene process cannot be used for Nickel 201 plate. NOTE: The information and data in this product data sheet are accurate to the best of our knowledge and belief, but are intended for informational purposes only, and may be revised at any time without notice. Applications suggested for the materials are described only to help readers make their own evaluations and decisions. They are neither guarantees nor warranties of suitability, express or implied, for these or other applications.